An Invitation to a Koi Keeper. .
Buglasan – The annual celebration of the “Festival of Festivals” in Negros Oriental is also the perfect season to celebrate the Koi Keeping Hobby in the Province. Koi are considered to be the most popular fresh-water ornamental pond fish and are often referred to as the “living jewels” of the fish keeping hobby. Koi breeding has been popular in the Philippines and Negros Oriental is no exception. In fact, as the number of Koi breeder increases, the more people are getting into Koi keeping. Consequently, with the demand of obtaining the highest quality of Koi, the Dumaguete Koi Club (DKC) was established in 2016. With the initiatives of its members, DKC successfully held its 1st Buglasan Koi Show last October 19-22, 2016 at Robinsons Place Dumaguete. The event was participated not only by the Koi enthusiasts of Negros Oriental but also by neighbouring cities like La Carlota City, San Carlos City, Negros Occidental, and Cebu City. The purpose of the Koi Show is not only to showcase the beauty of Koi but also to encourage camaraderie among the Koi Keepers of Negros Oriental. 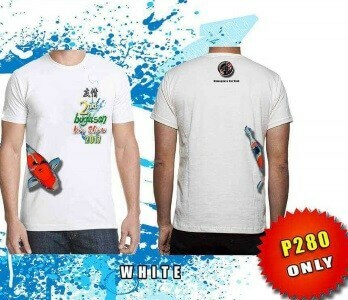 This year, we will take another step to showcase the Koi Keeping hobby and the Buglasan Koi Show is the best platform. In partnership with All Philippine Koi Society (APKS) and its international affiliate, the South East Koi Club of England we are challenged to raise the standards of Koi Keeping in Negros Oriental. 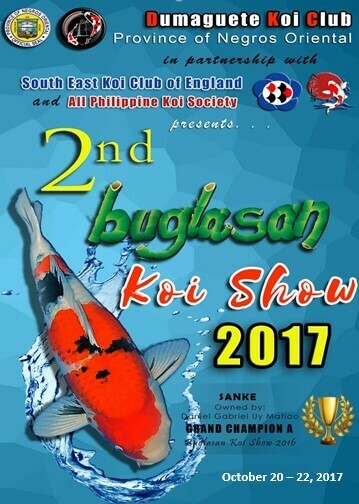 More so, we would like to invite everyone to join the Dumaguete Koi Club to celebrate the passion for Koi Keeping in the 2nd Buglasan Koi Show 2017. 1. This is an invitational and open koi show. 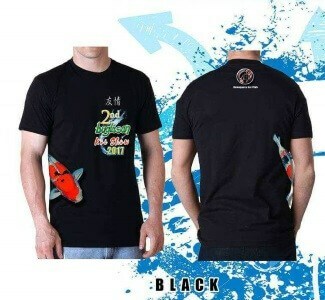 The entrants are expected to accomplish and sign the koi entry form. Entrants are required to submit their entry form a week before the koi show so the committee can prepare in advance the necessary number of vats needed. 2. Koi registration (benching) will be from 8:00 AM – 12:00 Midnight on October 20, 2017. No fish will be accepted after the said benching schedule except allowed by the Benching Committee. 3. On the 20th of October (benching period), entrants can bring and use their own air pumps/compressor for their fish but on the 21st of October (judging period), all pumps will be replaced with aerators provided by the Show Committee. 4. FEE: PRE-REGISTRATION IS MANDATORY. Registration fee is 1 Koi-P350.00, 2 Koi-P600.00, 3 Koi-P750.00 and P200.00/koi for additional entries. Reserved Vat is P300.00. A vat should only contain 3 Koi if size is above 30cm and 6 – 9 Koi if below 30cm. There will also be common vats (FREE) intended for the entrants who opt not to rent an exclusive vat. 5. The KOI ENTRY FORM must be completely filled out, signed and full payment of entry fees be made prior to fish being accepted into the show. 6. Photos of the Koi will be taken at the registration. 1. For the protection and health of your fish, feeding should be discontinued for a minimum of 5 days prior to the show. 2. Entrants must remain at the registration area until all paper works is done for registration and their fish have been benched and released into their appropriate vat. 3. Fish deemed to be showing signs of disease, significant injury, or deformity will NOT BE ALLOWED to join the show. New injuries considered temporary may be allowed by the judges. 4. The Benching Committee will measure and classify each fish. 5. Fish will be on display for the whole duration of the show. 6. Fish may be removed from the show site after the release approval announced by the Benching Committee. 7. Any decision made by the Screening and Benching Committees is FINAL. They will decide any contingencies not covered by these rules. 1. Judging will start from 1:00PM on October 21, 2017. 2. Prior to judging, all fish will be reviewed by the Benching Committee for disease and significant injury and to assure the fish are entered in the proper size and category. No one other than the judges and the fish handlers will be allowed inside the show area. 3. Judging is open to silent viewing. Comments or questions from the audience and even to the fish handlers are not allowed unless asked by any of the judges for information. 4. BEFORE JUDGING: Anyone wishing to inspect his/her personal fish must first ask the approval of the Show Coordinator. NO ONE is allowed to handle any fish except the judges and the fish handlers during judging.